This week, as we explore the beautiful projects that you can knit using Universe, a lovely linen-cotton yarn by Universal yarns, I’ll draw your attention to 3 ways to start your circular knits from the center out. 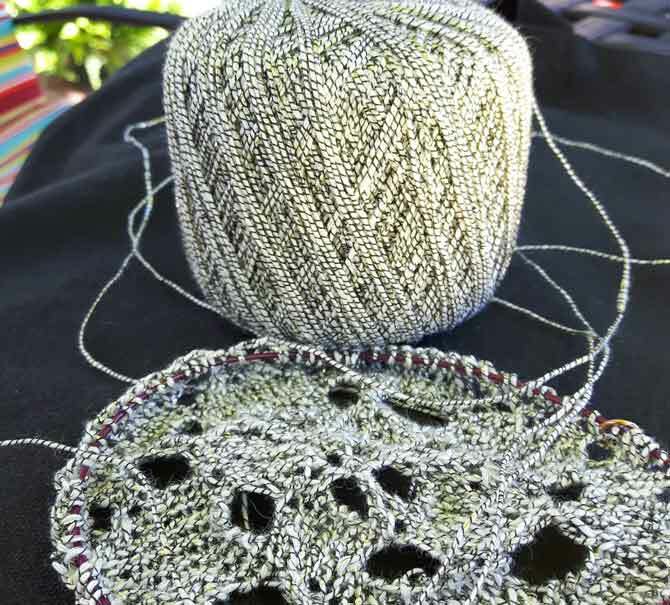 Universe is perfect for lace knitting, and we’ll see a few examples of what that looks like today. Center-out cast-on techniques are great for any type of circular project that either comes to a point, like a hat, or needs to lay flat, like a circular washcloth. Well, it’s tricky to see, but in this unblocked piece of circular lace, I started knitting from a center-out cast-on — a nice neat one that cinches up tight and neat. Here’s a better picture of what this piece looks like on the blocking mat. 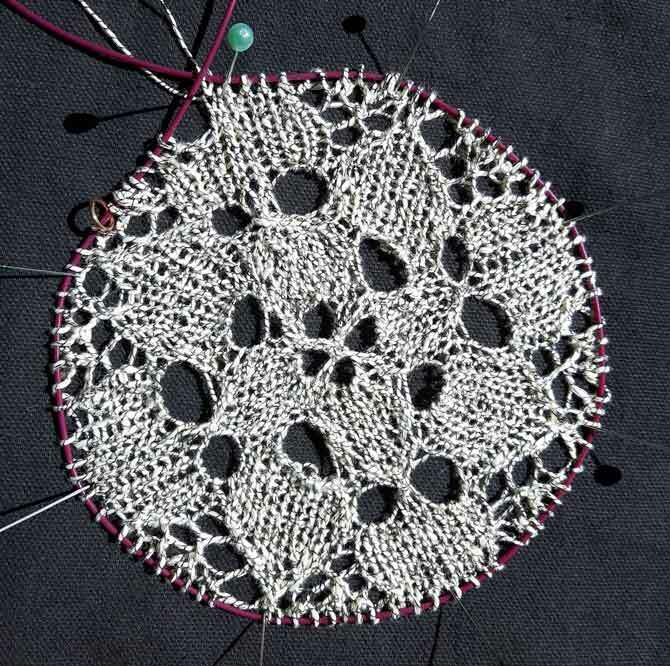 This neat cast-on, which allows you to cinch up the stitches at the center of the circle, has been explained at length and illustrated by blogger TechKnitter (who prefers to stay anonymous). She calls it the disappearing loop method. And while it may feel a little awkward the first time you attempt it, this cast-on is one of my favorites. She mentions a different center-out cast on which is based on crochet. So for any of you whose fingers dabble in both (or even more) crafts, Emily Ocker’s cast on is quite straightforward. It’s not the same thing as crochet’s “magic ring”, so don’t get the two confused. This is more of a situation where Tunisian crochet meets regular crochet to benefit knitters. A third center-out cast on that works is the famous Magic Cast-on for toe-up socks that was developed by Judy Becker. For most toe-up socks you would be casting on at least 18 to 26 stitches using this method, which leaves a nice, seamless, no-ridge toe. 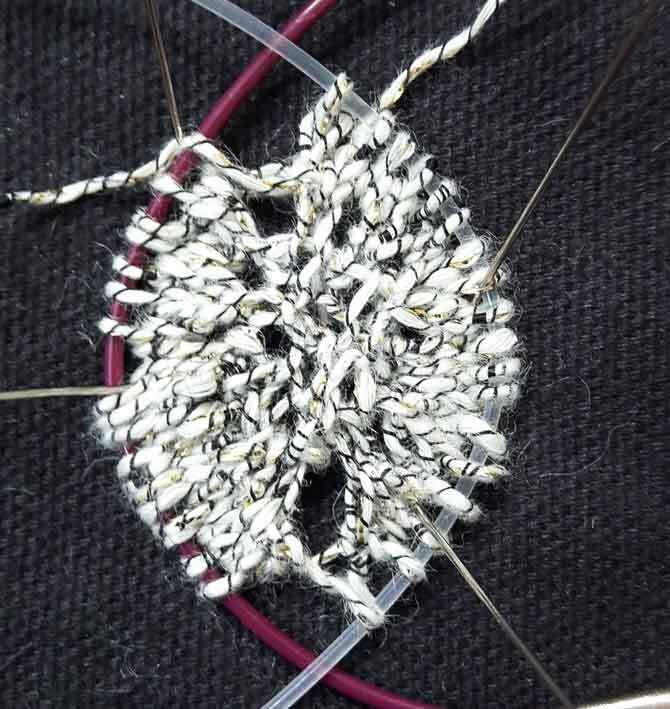 If you use this method to cast on 6 or 8 stitches, and you start the lace pattern right away, there’s no horizontal line of stitches. Instead a nice circle forms. If you already know this cast on, it’ll be a simple transition to use it for knitting circular lace. A fourth option for starting a circular lace project is the garter stitch tab. The garter stitch tab often appears in older triangular shawl patterns, but it’s well-suited to circles as well. In the photo above, you can see that I’ve cast on 3 stitches and knit 7 rows. This creates 3 garter stitch ridges. To make the circle, you leave the 3 sts on the needle, then pick up and knit a stitch in each garter ridge edge (that’s 3 across one side, 6 sts altogether). Then you pick up 3 stitches from the cast-on ridge, and 3 more from the garter ridges on the other side (12 sts in total). I use 2 circular needles for my circular projects, but if you prefer double-pointed needles, you could have 3 stitches on each of 4 needles and knit with the 5th around. 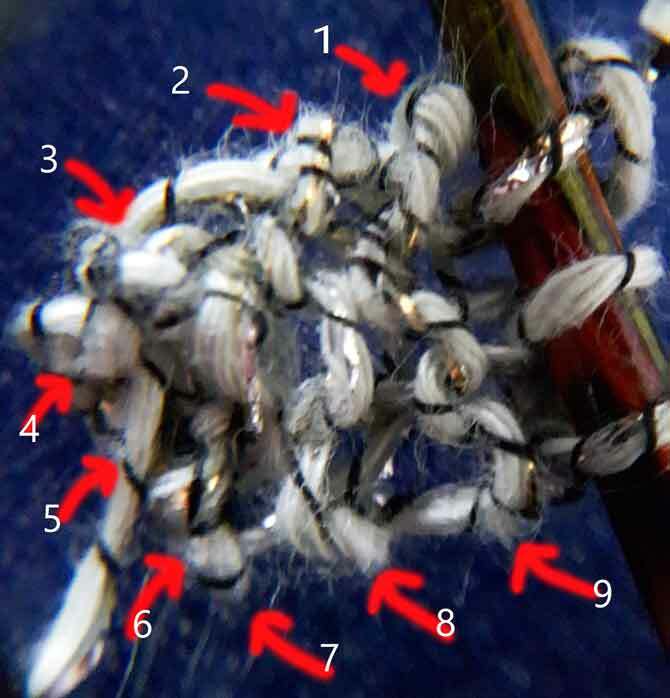 If you prefer the magic-loop method, you would put 6 stitches on each circular needle. 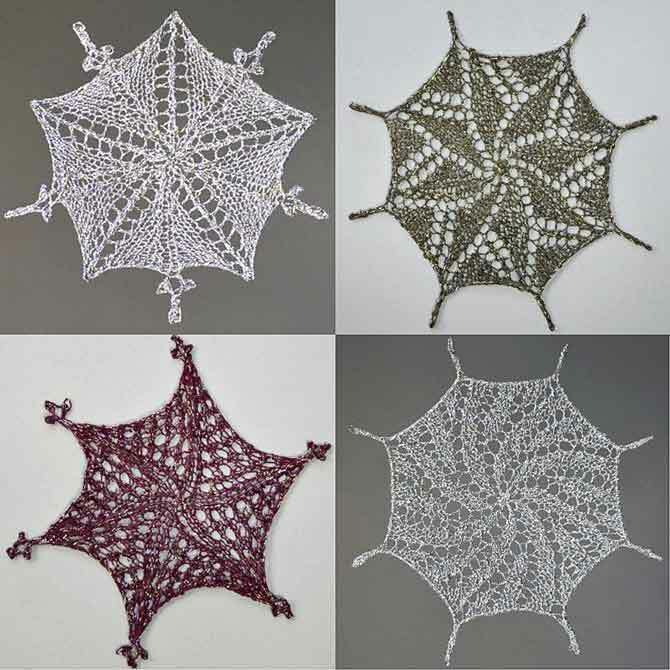 Amy Gunderson of Universal Yarns has designed 11 beautiful snowflakes that feature Universe yarn. These projects would be a good way to practice using any of these 4 center-out cast-on techniques. I think these snowflakes are just magical! Hmmm, there’s the magic cast on, the magic ring, the magic loop…as knitters, we’re really enthralled with what we do, and yes it sure can be magical. I hope you find some time to knit some magic with what we covered today.